It turns out that the chromosomes in laboratory stem cells open slowly over time, in the same sequence that occurs during embryonic development. It isn't until certain chromosomal regions have acquired the "open" state that they are able to respond to added growth factors and become liver or pancreatic cells. 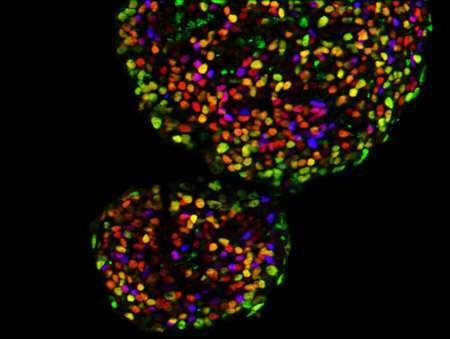 This new understanding, say researchers, will help spur advancements in stem cell research and the development of new cell therapies for diseases of the liver and pancreas, such as type 1 diabetes. "Our ability to generate liver and pancreatic cells from stem cells has fallen behind the advances we've made for other cell types," said Maike Sander, MD, professor of pediatrics and cellular and molecular medicine and director of the Pediatric Diabetes Research Center at UC San Diego. "So we haven't yet been able to do things like test new drugs on stem cell-derived liver and pancreatic cells. What we have learned is that if we want to make specific cells from stem cells, we need ways to predict how those cells and their chromosomes will respond to the growth factors." Chromosomes are the structures formed by tightly wound and packed DNA. Humans have 46 chromosomes - 23 inherited from each parent. Sander, Ren and their teams first made maps of chromosomal modifications over time, as embryonic stem cells differentiated through several different developmental intermediates on their way to becoming pancreatic and liver cells. Then, in analyzing these maps, they discovered links between the accessibility (openness) of certain regions of the chromosome and what they call developmental competence - the ability of the cell to respond to triggers like added growth factors. "We're also finding that these chromosomal regions that need to open before a stem cell can fully differentiate are linked to regions where there are variations in certain disease states," Sander says. In other words, if a person were to inherit a genetic variation in one of these chromosomal regions and his or her chromosome didn't open up at exactly the right time, he or she could hypothetically be more susceptible to a disease affecting that cell type. Sander's team is now working to further investigate what role, if any, these chromosomal regions and their variations play in diabetes.